As Thanksgiving quickly approaches, you may be finalizing travel and/or menu plans, frantically cleaning house in anticipation of guests arriving (maybe that is just me), or counting down the days to Black Friday. 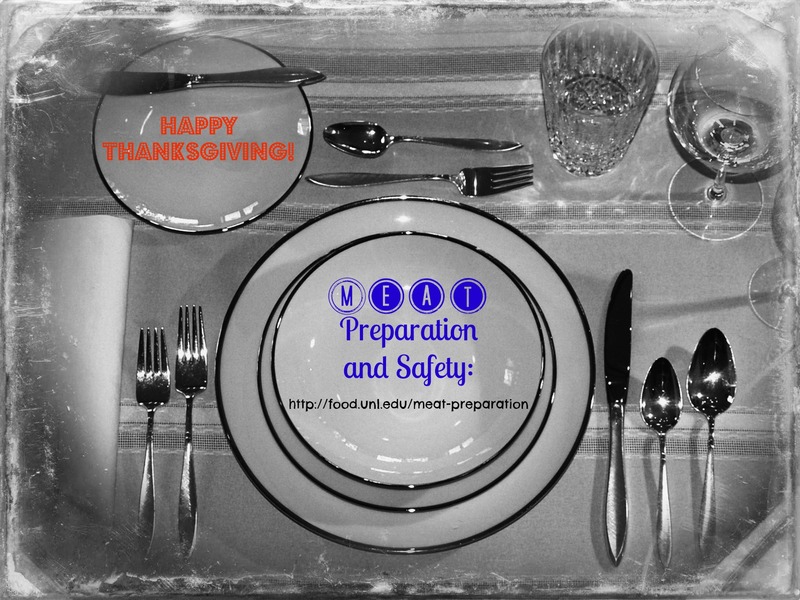 In all of the craziness of the holiday season, don’t forget about the meat and food safety of your main dishes. Regardless if you are serving a new cut of beef, frying a turkey, serving savory seafood, glazing a ham, slow roasting lamb, or BBQing it is important to make sure you and your loved ones enjoy your time together! For a little holiday fun you could even visit the UNL Meat Preparation and Safety webpage and quiz your Thanksgiving guests to see who is the most meat savvy (I am easily entertained!). Photo from Tom Reeder’s blog. Enhanced with PicMonkey. What are you serving this Thanksgiving? We are serving the traditional turkey, as my sister-in-law is visiting from London, and we thought she would enjoy seeing the American holiday in all of its glory! I can’t believe it is already the middle of August! Where has the summer gone?! I feel like mine was spent dragging a suitcase through an airport, where I got more sleep on an airplane than I did in my own bed. The good news, I have a ton of posts in my head, I just need to get them down here! 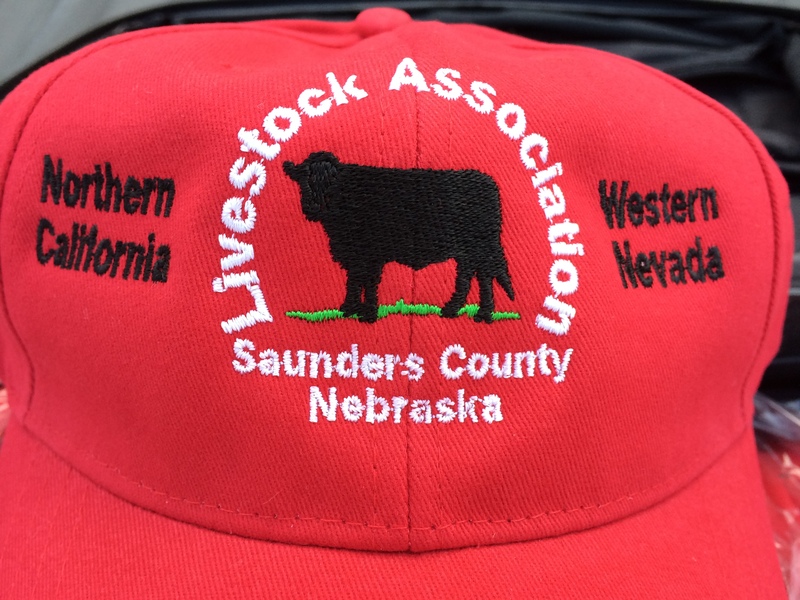 One of my job responsibilities is to provide the Saunders County Livestock Association members with an annual agricultural tour. This was their 56th annual! Pretty amazing that there is that much history and tradition within this county based association. It is also tradition for the Extension Educator who does the tour to take them to their “home” area, for me that is Western Nevada and Northern California. The annual cap is nearly as important as the annual tour! And the red was a great color choice to find persons in our group when we were in busy public spaces. I had 43 men sign up for the tour (the women stay home and supposedly have their own vacations while the men are away); good thing I am tough and can handle that much testosterone! Since we were flying, I had planned a six day, five night adventure out into the Wild West. We traveled via planes, boats, and buses 🙂 Below are photos from our recent trip. This was only my second tour to plan, but oh what a learning experience these have been! You would think that since these guys see and deal with agriculture everyday, they would not want to see more of it when on vacation. But that is further from the truth – they love to see what other farmers and ranchers are doing across the county. 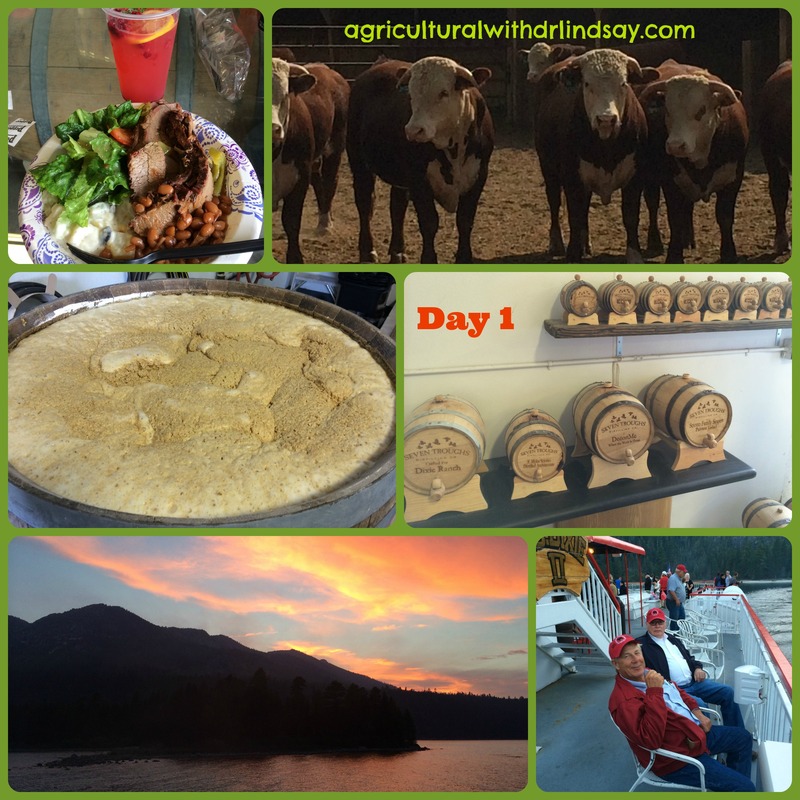 I hope you enjoy this recap as much as the guys and I enjoyed participating in the 56th annual trip! We flew from Omaha, NE into Reno, NV. In route we saw Lake Mead near Las Vegas. And we saw a great bear mount in Reno. Day 1 included a trip to Seven Troughs Whiskey Distillery where we had a great catered lunch consisting of brisket and tri-tip (a west coast meat treat). We also got to see the open air fermentation process they use for their spirits. We toured a beautiful ranch where we saw some great Hereford bulls. And finally, we ended the day with a relaxing dinner cruise on Lake Tahoe. As an extra bonus, two representatives with the Nevada Department of Agriculture joined us. 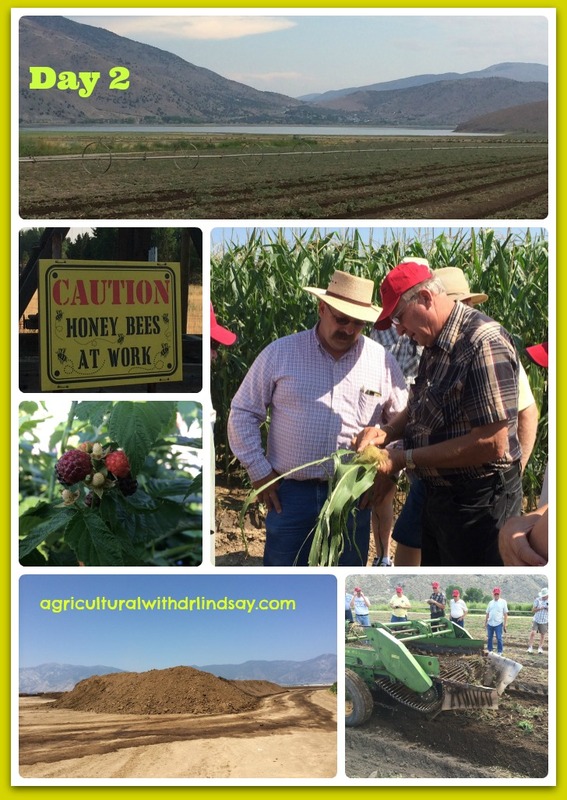 It was a great addition as the tour participants could ask them about all things concerning Nevada agriculture. My parents hosted the group for a Lamb BBQ Dinner. Some in the group were not terribly thrilled about this, as they had experienced mutton before (which is old sheep, and very different than lamb). David, the garlic tour host gave our group an entire burlap bag of garlic, so we cleaned some of it up and threw it on the grill too. I think by time the night was over the group had developed an appreciation for lamb and roasted garlic! Day 3 meant heading over the Sierra Nevada Mountain range – which was hard on a few of the guys. Personally, I enjoyed being back in the mountains and enjoyed the scenic beauty. On this day the Sacramento County Farm Bureau hosted us and provided a turkey farm stop, a cutting edge dairy that has an automated calf feeding machine (which provided milk, hay, and grain every couple of hours) and a huge methane digester that we could walk on! We also went to a sturgeon caviar farm and saw the fish in various life stages. The fish also enjoyed our visit and splashed us as they showed off. We topped off the night with barrel smoked steaks at Giusti’s (locally recommended and enjoyed too). On this day my Mom also hopped on the bus with us! Day 4 was spent in the Delta, just south of Sacramento, CA. It was a great day to see the diversity of crops grown. It was also pear harvesting season, so we enjoyed fresh pears and pear ice cream! Our Delta tour guide also made the day extra special by finding some fellow Nebraskans (i.e. Huskers) living in the area that hosted us for lunch. Come to find out one of the hosts and one of the tour participants were kin! We finished out the day at an olive tree and oil processing farm, where my tour participants were thrilled to talk wheat farming on California hills with the family! 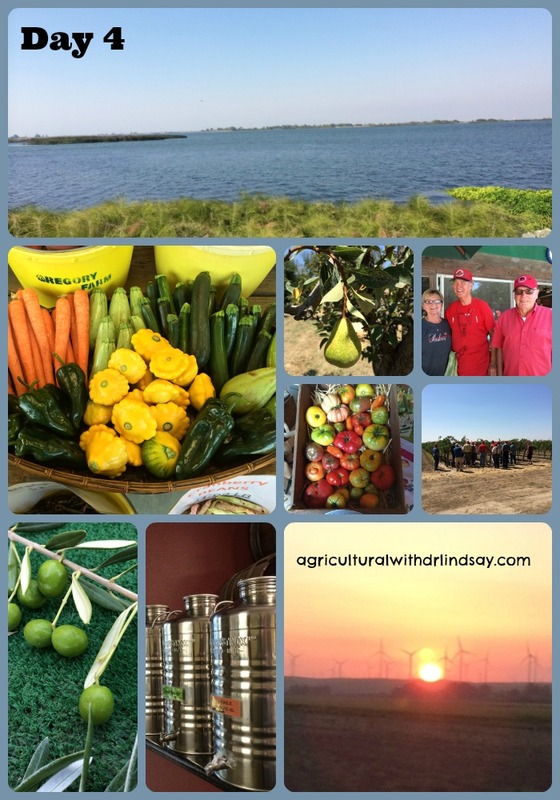 This was an eye opening day to the diversity of agriculture in the area. We also saw first hand and heard about the effects of the drought as well as the fight for water for agriculture. It will be a tough battle for California agriculture, one that we are now more sympathetic too. The interesting thing about planning a tour like this is how it changes over the months (I start planning in January, and we leave in August). My original day 5 was much different than the day 5 we got, but it was an excellent day. 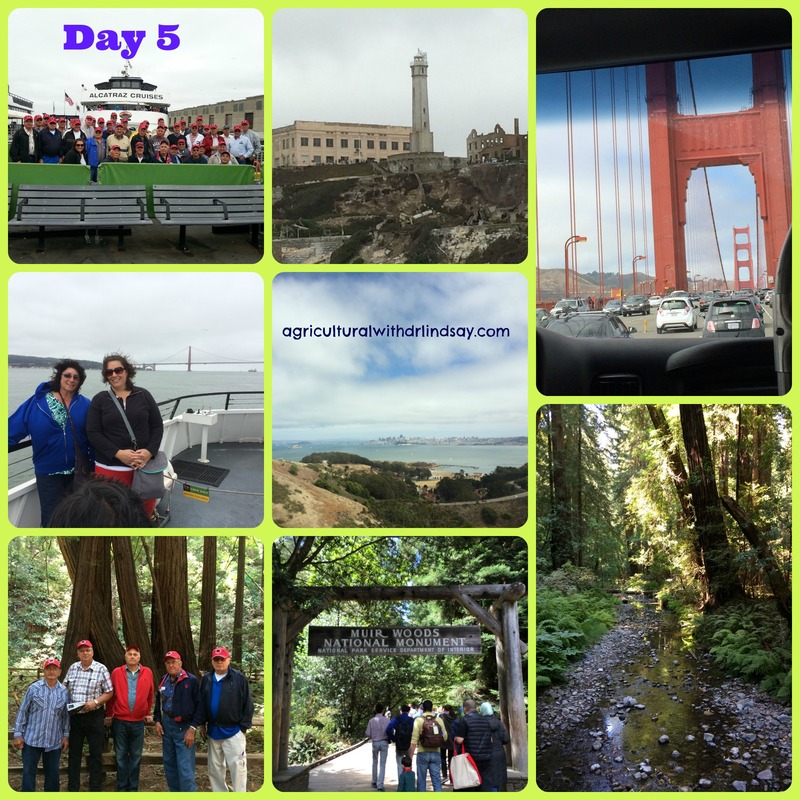 Day 5 was a day to do and/or see the things in San Fransisco that interested you most. For some that included trolleys over the infamous hills of San Fransisco, the seals, mass at a Catholic church, and more. For me it was taking in a variety of things (and time with my Mom). I was not able to get our group tickets to tour Alcatraz (as I should have booked those in January! ), so we did the next best thing – a boat ride around Alcatraz and Angel Islands and under the Golden Gate Bridge. Next a group of us took a tour up to Muir Redwoods. While it was busy, it was beautiful and peaceful. We couldn’t have asked for better weather or scenery that day. Day 6 was just a travel delay. We left San Fransisco and headed back to Omaha. The entire experience was great, there was only one bag that got lost coming back to Nebraska. Not too bad for 44 people traveling for six days!! This tour was especially important to me, as I took everyone “home” to see the area I was born and raised in. It was very interesting to see things through 43 other sets of eyes. These tours are a lot of work, but they are also a lot of reward to see them come together. 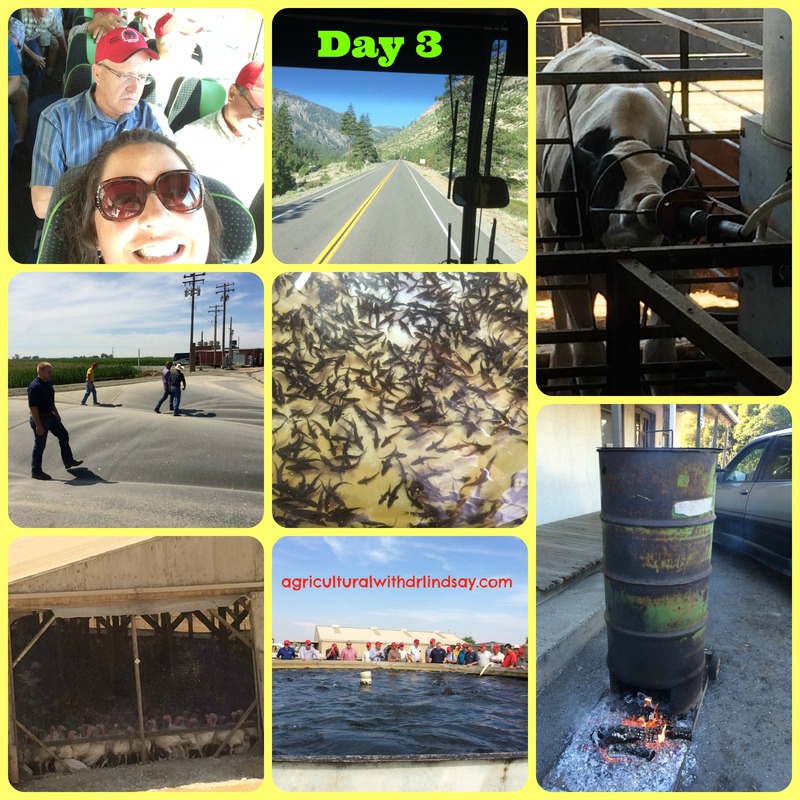 I have heard many of the Livestock Association members reference how great the trips were when the other Educators prior to me took the group “home” – so I had big shoes to fill! I think all of the guys really enjoyed it, and it will be one they talk about for years to come. P.S. – my Mom was already invited to hop on the bus again next year! If you would like more information about any of our tour stops, tips for planning a large tour, or are interested in participating on a farm/ranch tour – please let me know. Since it is Lamb Lovers Month and because I love lamb, today I bring you a favorite Indian curry recipe! The hubs and I love the cookbook easy indian, by Das Sreedharan – always delicious and user-friendly! The best thing about this recipe is that you can modify it to fit your tastes and availability of ingredients. This recipe calls for lamb, but you could use beef or chicken instead. Every year for Christmas my parents provide us with a cut and wrapped lamb (I know, an awesome gift! 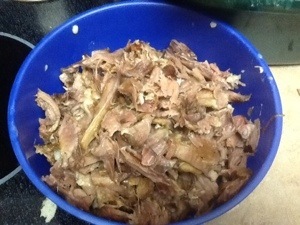 ), so I throw the neck and ribs into the crockpot to cook, then separate the meat from the fat and bone. Although the neck and ribs are not the meatiest parts of the lamb, they are flavorful and are great for curries and stews! Together in a deep frying pan combine oil, garlic, peppers (I used Serrano), ginger (I usually get the packaged stuff so it lasts longer), and cook several minutes. Add the onion. 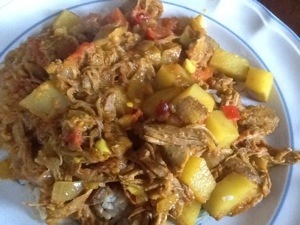 Add spices (it calls for curry leaves, since those are not readily available to me, I just use curry powder), tomatoes (I had some frozen ones from my garden I used instead of fresh ones), potatoes (I cubed a large baking potato), water, and lamb – if using raw meat. Since I used previously cooked meat, I just let the vegetables and spices simmer without the meat for a bit. When the potatoes are nearly tender add the lamb and let simmer for several minutes until the flavors combine. I like to serve this with Naan Bread or over rice. Yum! 1. Heat 4 Tbsp. oil in saucepan. Add ginger, garlic, chilies, and 5 curry leaves. Sauté for 3 minutes or until the ginger and garlic are golden brown. Add onions and cook, stirring frequently, for 10 minutes until lightly browned. 2. Stir in ground coriander, turmeric, and chili powder, mix well. 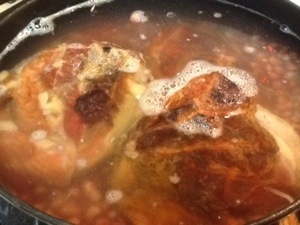 Add tomatoes, lamb, and 14 ounces water. Simmer for 15 minutes. 3. 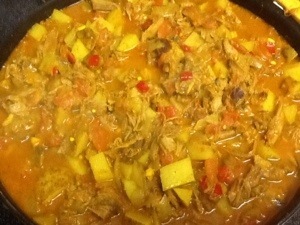 Stir in potatoes and cook for 15 minutes, or until lamb is cooked and potatoes are tender. 4. Meanwhile, heat 1 Tbsp. oil in small frying pan. 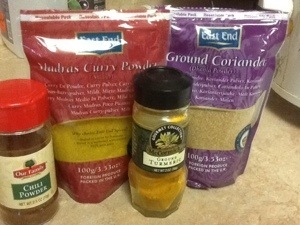 Add the mustard seeds, when they start to pop add the remaining 10 curry leaves and stir well. 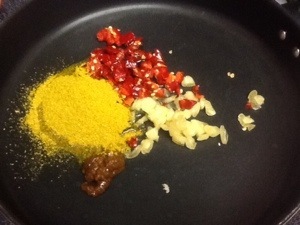 Pour mustard seed/curry leaf mixture over the lamb mixture, stir briefly, remove pan from heat. 5. Serve with Malabar parathas or other Indian fry bread. 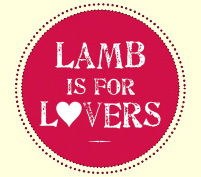 February is Lamb Lovers Month! I just received an email from the American Lamb Board saying that February is Lamb Lovers Month! 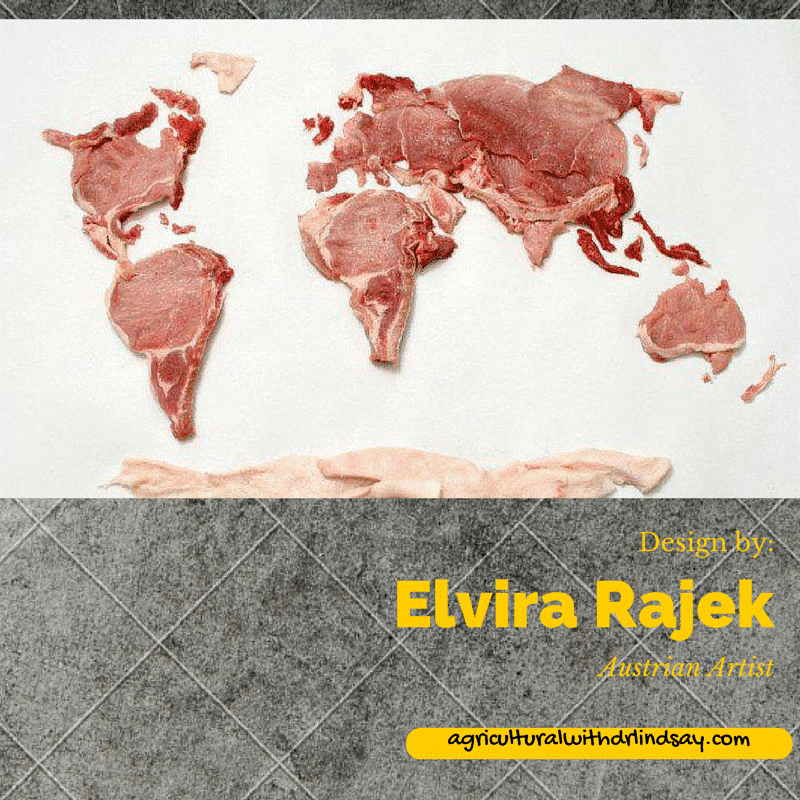 No doubt many of the meat industry groups will share similar sentiments in the coming weeks. But seriously, nothing says love like the sizzle of meat! 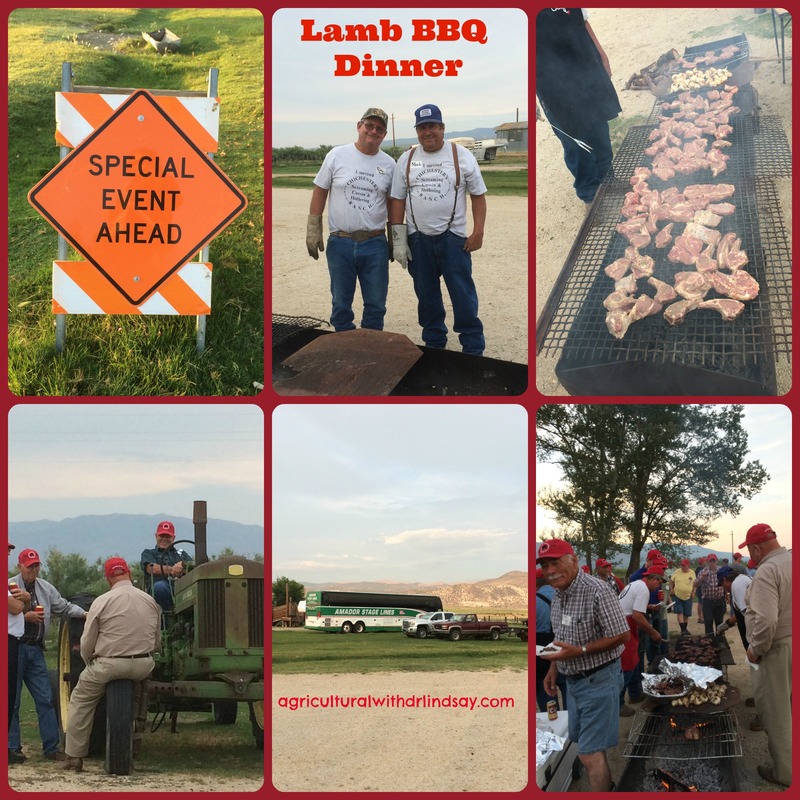 If you are a regular reader of this blog, then you know I love to eat lamb! So I will profess my love for it. You can too! To state your love for lamb and have a chance to win prizes, you will need to write a love letter! Three winners will be chosen weekly throughout February to win a prize package, which includes fresh lamb for a home cooked romantic meal. So whether your love for lamb is in the early courting stages, or you have many years of love under your belt, send your letter in today confessing your love of lamb! Every year at this time I make the resolutions to loose weight, get more excersise, sleep more, read more, achieve some academic goal, stay in better contact with my friends, etc. And every year at this time I reflect that I started each of those goals like a gangbuster, but for one reason or another realize I didn’t meet my resolution goals. So over the last couple of days I have been thinking about this differently, instead of setting myself up for failure year-after-year, why don’t I just make my resolution something I can achieve?! I know, not a difficult concept, but apparently I can be a slow learner! So for the 2014 year I have only one resolution: to be a better ME! What goes into being a better me you might be asking? Well this is how I am defining it, I will do things that make me happy! There are a lot of things that make me happy (I am a pretty eclectic person), I just have to make the time to do them – and not feel bad about doing it. Well that sounds easy enough right? To make myself more accountable I am declaring one day a month “Lindsay day,” a day to do something that makes me happy. That could be a date day with the hubs, antique hunting, crafting, a walk or bike ride, exploring a new community, wine with friends, trying a challenging recipe, starting a new book, anything! That is the joy of it, it can be anything! By being a better me, I have no doubt that I will be a better spouse, friend, colleague, daughter, sister, thinker, learner, and blogger 😉 What is your 2014 resolution? I enjoy cooking (most of the time), so on my way to being a better me, I have spent a portion of the day making some good ol winter food. 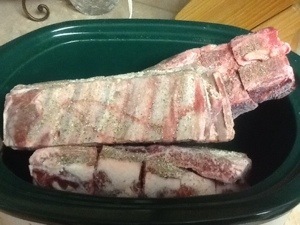 In the crockpot I have a lamb neck, brisket, and ribs (remember lambs are smaller than beef, so it fits fairly easily). For Christmas my folks gave us a lamb cut and wrapped, nothing says love like those little white packages! I love to let these cuts slow cook all day, or overnight, and then separate the meat from the bone and fat. It is so tender, juicy, and delicious! The hubs has requested a spicy lamb curry for our New Year’s lunch tomorrow, there should also be enough lamb to make a tasty little stew. I will post pictures of the end products! What tasty treats are on your new year menu? Meet my Mom, Terri. She is feeding a bottle of milk replacer to a bummer lamb. A bummer is an animal that has lost its mom and needs to be cared for by us, their human caregivers. 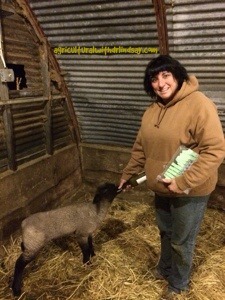 This lamb has a bottle 3-4 times a day in addition to eating hay, she is growing like a weed!